MindSpec seeks an Administrative Assistant to provide office services to their team of scientists. This a part-time position (up to 20 hours/per week) in which the successful applicant will be responsible for implementing administrative systems, procedures and policies, as well as monitoring administrative projects. Provide general administrative and clerical support. Provide information by answering questions and requests. Sort and distribute incoming correspondence. Manage office calendar and employee attendance. Schedule and coordinate meetings, appointments and travel arrangements. Minimum of three years’ experience. College degree from an accredited university. Excellent command of English language in verbal and written communications. Demonstrated ability to gather and synthesize information. Send letter of application and resume to job@mindspec.org. Full and part time bioinformatics annotator positions are available at MindSpec, Inc. We are currently developing additional interactive database modules for AutDB/SFARI Gene. Annotators will be responsible for extracting data from scientific literature using controlled vocabularies. We are seeking talented and motivated individuals interested in working in a multi-disciplinary team. Responsibilities include annotation of disease-related information for data mining and visualization. The positions offer an opportunity to work in the rapidly evolving area of multi-factorial disease biology in a flexible, dynamic research environment. Applicants must have an M.S. degree or higher in Bioinformatics/Molecular Biology/Neurobiology or related field with a strong knowledge of genetics and disease biology. Applicants should also have excellent written and oral communication skills; display good ability to work with others, and the ability to conduct assignments on multiple projects under tight deadlines. Please send cover letter and curriculum vitae to job@mindspec.org. Paid bioinformatics annotator internships are available at MindSpec, Inc. We are currently developing additional interactive database modules for AutDB/SFARI Gene. Interns will be trained to extract data from scientific literature using controlled vocabularies. We are seeking talented and motivated individuals interested in working in a multi-disciplinary team. Responsibilities include participating in the annotation of disease-related information for data mining and visualization. The position offers an opportunity to work in the rapidly evolving area of multi-factorial disease biology in a flexible, dynamic research environment. Applicants must have or be pursuing an B.S. degree or higher in Bioinformatics/Molecular Biology/Neurobiology, or related field, with a strong knowledge of genetics, animal models or neuroimaging. Applicants should also have excellent written and oral communication skills; display good ability to work with others, and the ability to conduct assignments on multiple projects under tight deadlines. 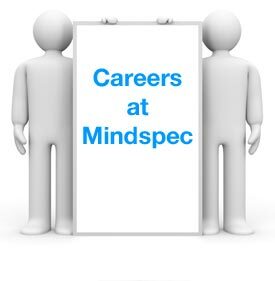 MindSpec seeks an experienced software engineer with strong knowledge of C++, Java, Ruby, Python, or other modern programming languages and associated web application frameworks. We need someone to work with our team to develop dynamic solutions to the problem of managing and presenting large, complex scientific data sets. Must have excellent software development skills. Must have a keen understanding of the process of software development. Must have web development experience. Must work well in a team. Must be willing to multitask and be very self-directed. Must have at least some system administration skills. This is a salaried position, with full benefits. Compensation will be set DOE. How to Apply: Please send portfolio and resume to job@mindspec.org.